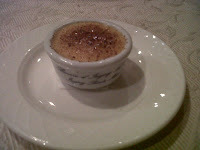 The Frenchman's Food & Wine Blog: Clarke's of North Beach - a seriously fine dining BYO restaurant! Clarke's of North Beach - a seriously fine dining BYO restaurant! This is an unbelievable find, I must say. So good that I'm happy to make the long drive to 97a Flora Terrace in North Beach, Western Australia (okay so it's a 20 minute drive, but that's long by my standards!) again tomorrow night for a dinner put on by Stephen Clarke (who was once the personal chef to the Earl & Countess of Leicester, and also cooked for the Queen and Prince Phillip). If you want a serious culinary experience delivered by a seriously good, multiple award-winning chef, Clarke's of North Beach is the place to go. On my first visit last week, I caught up with my best mate Brandon who's back in town for a few weeks. Angela was kind enough to drive us there and drop us off, and to come back to pick us up! Okay, I'll let the pictures do most of the talking, since I remembered to take a few shots. I remarked to Brandon that everything on the menu looked so good - only if the food sold on Czech pricing, we'd do what we did at Spindleruv Mlyn and order 2 entrees and 2 mains each, and then worry about how to finish it all off (in case you're curious - our Czech meal cost less than AUD100 altogether, including wines, despite our wanton gluttony). 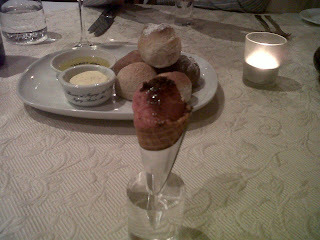 An amuse bouche of strawberry ice-cream served in a minature waffle cone and topped with crispy caramelised balsamic vinegar crystals. For entree: a little display of marron, celery sorbet, celery-salted popcorn and marron panacotta (which looked like a bit of a light pate). Strange bedfellows at first glance, but the flavours truly work together! 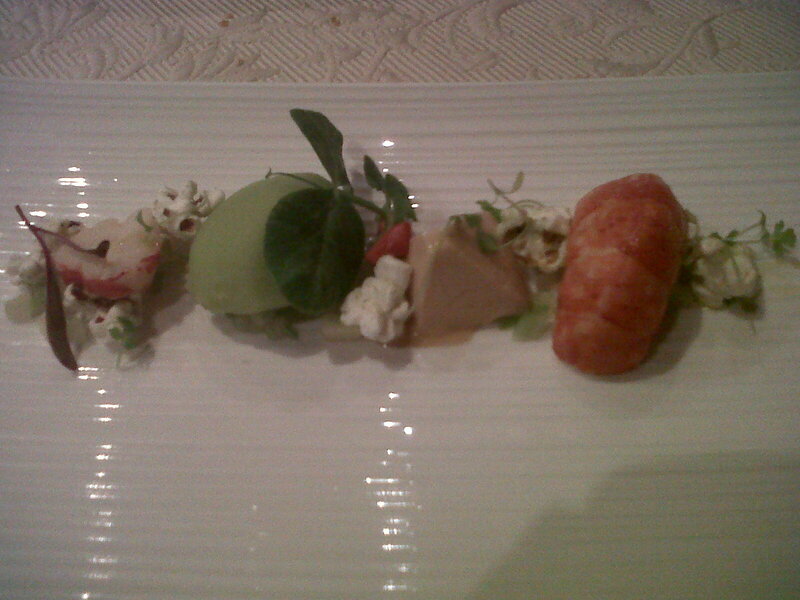 There was even a little marron claw in the line up. For my main: Sous vide of salmon - he's clearly had far greater success than my feeble attempt at this delicate art of vacuum cooking. The fish is cooked evenly all the way through, yet it is unbelievably moist, pink and juicy, with absolutely no dry bits at all! A mini creme brulee for pre-dessert (now this course is certainly a concept that a hobbit would appreciate, along with second breakfast and elevenses). find even in fine-dining restaurants! A tasty selection of cheeses for dessert - but the remarkable thing is the stuff that accompanies the cheese - not your usual bunch of muscatels and wafer crackers, no sirree! Try red wine poached pear, fennell and apple salad; and the Bouche D'affinois is gently heated in a little copper pot to get it soft and thickly runny, and served with homemade rye bread. The service was excellent, as you would expect from a top notch restaurant, and is courteous, professional and unobtrusive without being snooty. They're young but well-trained, friendly people. $4 a head corkage is unbelievable value for the quality of glassware and service you get - the waitstaff will pour your wines for you when it's time for another glass. Many lesser restaurants will have the cheek to hit you with a $10 charge, give you what looks suspiciously like Ikea glassware (or worse a goblet), and allow you the privilege of pouring your own wine. If you want your wine decanted, it's an extra $10, but probably a good idea if you've got a fresh young shiraz that's exploding with tannins; or if you have that well aged treasure from your cellar, which needs some air for the build up of sulphur to blow off. As for me, I brought my precious original Super Tuscan - the Tignanello. This was a most drinkable bottle of wine - savoury plummy earthy flavours, silky soft mouthfeel, finished off with persistent fine and long lasting tannins. It was so well made that we didn't really notice the tannins until towards the end of the bottle (which came rather fast because it was so easy to drink! ), when the cumulative tannic build-up on the palate finally because noticeable. It certainly had a few more years (at least) left in it, alhough it was already drinking beautifully at 7 years. I can't wait to eat at Clarke's again tomorrow, when Stephen will be working his team hard to churn out an even more memorable and delicious dining experience! Fortunately for those of us who live in Karrinyup, it is (almost) within staggering distance. Have been meaning to give Clarkes a try and am now inspired by your report to double my efforts to do so. 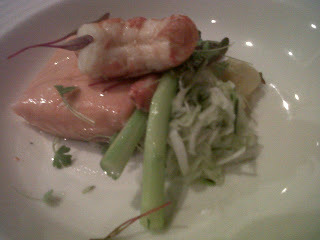 As one of the chefs, I'm pleased to hear that u had a wonderful time many thanks the chefs at clarkes. Garth Waterton. Well done indeed, Garth and your fellow chefs! Keep challenging yourselves and your diners. I will need to make the long trek back to your restaurant very soon!